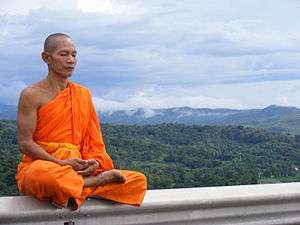 Monk meditating beside Sirikit Dam in Thailand. Buddhist meditation refers to the meditative practices associated with the religion and philosophy of Buddhism. Core meditation techniques have been preserved in ancient Buddhist texts and have proliferated and diversified through teacher-student transmissions. Buddhists pursue meditation as part of the path toward Enlightenment and Nirvana. [lower-alpha 1] The closest words for meditation in the classical languages of Buddhism are bhāvanā[lower-alpha 2] and jhāna/dhyāna. [lower-alpha 3] Buddhist meditation techniques have become increasingly popular in the wider world, with many non-Buddhists taking them up for a variety of reasons. Buddhist meditation encompasses a variety of meditation techniques that aim to develop mindfulness, concentration, supramundane powers, tranquility, and insight. Given the large number and diversity of traditional Buddhist meditation practices, this article primarily identifies authoritative contextual frameworks — both contemporary and canonical — for the variety of practices. For those seeking school-specific meditation information, it may be more appropriate to simply view the articles listed in the "See also" section below. While there are some similar meditative practices — such as breath meditation and various recollections (anussati) — that are used across Buddhist schools, there is also significant diversity. In the Theravāda tradition alone, there are over fifty methods for developing mindfulness and forty for developing concentration, while in the Tibetan tradition there are thousands of visualization meditations. [lower-alpha 4] Most classical and contemporary Buddhist meditation guides are school specific. [lower-alpha 5] Only a few teachers attempt to synthesize, crystallize and categorize practices from multiple Buddhist traditions. The earliest tradition of Buddhist practice is preserved in the nikāya/āgamas, and is adhered to by the Theravāda lineage. It was also the focus of the other now-extinct early Buddhist schools, and has been incorporated to greater and lesser degrees into the Tibetan Buddhist tradition and many East Asian Mahāyāna traditions. Most Buddhist traditions recognize that the path to Enlightenment entails three types of training: virtue (sīla); meditation (samadhi); and, wisdom (paññā). [lower-alpha 6] Thus, meditative prowess alone is not sufficient; it is but one part of the path. In other words, in Buddhism, in tandem with mental cultivation, ethical development and wise understanding are also necessary for the attainment of the highest goal. Right Mindfulness (samma sati) – exemplified by the Buddha's Four Foundations of Mindfulness (see Satipatthana Sutta). Right Concentration (samma samadhi) – culminating in jhanic absorptions through the meditative development of samatha. Classic texts in the Pali literature enumerating meditative subjects include the Satipatthana Sutta (MN 10) and the Visuddhimagga's Part II, "Concentration" (Samadhi). Mental Contents (dhammā): Hindrances, Aggregates, Sense-Bases, Factors of Enlightenment, and the Four Noble Truths. Meditation on these subjects develops insight. In the Pali canon, the Buddha never mentions independent samatha and vipassana meditation practices; instead, samatha and vipassana are two qualities of mind to be developed through meditation. [lower-alpha 10] Nonetheless, some meditation practices (such as contemplation of a kasina object) favor the development of samatha, others are conducive to the development of vipassana (such as contemplation of the aggregates), while others (such as mindfulness of breathing) are classically used for developing both mental qualities. ten recollections: Buddhānussaṭi, the Dhamma, the Sangha, virtue, generosity, the virtues of deities, death (see Upajjhatthana Sutta), the body, the breath (see anapanasati), and peace (see Nibbana). four divine abodes: metta, karuṇā, mudita, and upekkha. Particularly influential from the twentieth century onward has been the "New Burmese Method" or "Vipassana School" approach to samatha and vipassana developed by Mingun Jetavana Sayādaw and U Nārada and popularized by Mahasi Sayadaw. Here samatha is considered an optional but not necessary component of the practice—vipassana is possible without it. Another Burmese method, derived from Ledi Sayadaw via U Ba Khin and S. N. Goenka, takes a similar approach. 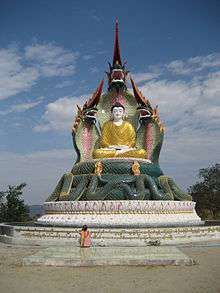 Other Burmese traditions popularized in the west, notably that of Pa Auk Sayadaw, uphold the emphasis on samatha explicit in the commentarial tradition of the Visuddhimagga. Also influential is the Thai Forest Tradition deriving from Ajahn Mun and popularized by Ajahn Chah, which, in contrast, stresses the inseparability of the two practices, and the essential necessity of both practices. Other noted practitioners in this tradition include Ajahn Thate and Ajahn Maha Bua, among others. Another less common type of meditation is practiced in Cambodia and Laos by followers of Tantric Theravada. This form of meditation includes the use of mantras and visualizations. Mahāyāna Buddhism includes numerous schools of practice, which each draw upon various Buddhist sūtras, philosophical treatises, and commentaries. Accordingly, each school has its own meditation methods for the purpose of developing samādhi and prajñā, with the goal of ultimately attaining enlightenment. Nevertheless, each has its own emphasis, mode of expression, and philosophical outlook. In his classic book on meditation of the various Chinese Buddhist traditions, Charles Luk writes, "The Buddha Dharma is useless if it is not put into actual practice, because if we do not have personal experience of it, it will be alien to us and we will never awaken to it in spite of our book learning." Venerable Nan Huaijin echoes similar sentiments about the importance of meditation by remarking, "Intellectual reasoning is just another spinning of the sixth consciousness, whereas the practice of meditation is the true entry into the Dharma." In the Pure Land tradition of Buddhism, repeating the name of Amitābha Buddha is traditionally a form of Mindfulness of the Buddha (Skt. buddhānusmṛti). This term was translated into Chinese as nianfo (念佛), by which it is popularly known in English. The practice is described as calling the buddha to mind by repeating his name, to enable the practitioner to bring all his or her attention upon that buddha (samādhi). This may be done vocally or mentally, and with or without the use of Buddhist prayer beads. Those who practice this method often commit to a fixed set of repetitions per day, often from 50,000 to over 500,000. According to tradition, the second patriarch of the Pure Land school, Shandao, is said to have practiced this day and night without interruption, each time emitting light from his mouth. Therefore, he was bestowed with the title "Great Master of Light" (大師光明) by the Tang Dynasty emperor Gao Zong (高宗). In addition, in Chinese Buddhism there is a related practice called the "dual path of Chán and Pure Land cultivation", which is also called the "dual path of emptiness and existence." As taught by Venerable Nan Huaijin, the name of Amitābha Buddha is recited slowly, and the mind is emptied out after each repetition. When idle thoughts arise, the phrase is repeated again to clear them. With constant practice, the mind is able to remain peacefully in emptiness, culminating in the attainment of samādhi. Repeating the Pure Land Rebirth Dhāraṇī is another method in Pure Land Buddhism. Similar to the mindfulness practice of repeating the name of Amitābha Buddha, this dhāraṇī is another method of meditation and recitation in Pure Land Buddhism. The repetition of this dhāraṇī is said to be very popular among traditional Chinese Buddhists. It is traditionally preserved in Sanskrit, and it is said that when a devotee succeeds in realizing singleness of mind by repeating a mantra, its true and profound meaning will be clearly revealed. Another practice found in Pure Land Buddhism is meditative contemplation and visualization of Amitābha Buddha, his attendant bodhisattvas, and the Pure Land. The basis of this is found in the Amitāyurdhyāna Sūtra ("Amitābha Meditation Sūtra"), in which the Buddha describes to Queen Vaidehi the practices of thirteen progressive visualization methods, corresponding to the attainment of various levels of rebirth in the Pure Land. Visualization practises for Amitābha are popular among esoteric Buddhist sects, such as Japanese Shingon Buddhism. In the earliest traditions of Chán/Zen Buddhism, it is said that there was no formal method of meditation. Instead, the teacher would use various didactic methods to point to the true nature of the mind, also known as Buddha-nature. This method is referred to as the "Mind Dharma", and exemplified in the story of Śākyamuni Buddha holding up a flower silently, and Mahākāśyapa smiling as he understood. A traditional formula of this is, "Chán points directly to the human mind, to enable people to see their true nature and become buddhas." In the early era of the Chán school, there was no fixed method or ple formula for teaching meditation, and all instructions were simply heuristic methods; therefore the Chán school was called the "Gateless Gate." Since the student cannot stop all his thoughts at one stroke, he is taught to use this poison-against-poison device to realize singleness of thought, which is fundamentally wrong but will disappear when it falls into disuse, and gives way to singleness of mind, which is a precondition of the realization of the self-mind for the perception of self-nature and attainment of Bodhi. The aim of the teachings of Mahamudra and Dzogchen, each taught by the Kagyu and Nyingma lineages of Indo-Tibetan or Vajrayana Buddhism, respectively, is to familiarize one with the ultimate nature of mind which underlies all existence, the Dharmakāya. Then, by meditating in union with the Dharmakāya, one gradually passes through each of the Ten Bhūmis until reaching liberation from saṃsāra and karma. The shared preliminary practices of both the Nyingma and Kagyu schools of Tibetan Buddhism are called ngöndro, which involves visualization, mantra recitation and sadhana practice, and many prostrations. Nyingma also focuses on three foundational practices in Tibetan Buddhism: Shamata (calm abiding), Tonglen (sending and receiving), and a "breath practice" called "Clearing the Stale Energies” that helps clear the mind in preparation for meditation. For a long time people have practiced meditation, based on Buddhist meditation principles, in order to effect mundane and worldly benefit. Buddhist meditation techniques are increasingly being employed by psychologists and psychiatrists to help alleviate a variety of health conditions such as anxiety and depression. As such, mindfulness and other Buddhist meditation techniques are being advocated in the West by innovative psychologists and expert Buddhist meditation teachers such as Thích Nhất Hạnh, Pema Chödrön, Clive Sherlock, Mother Sayamagyi, S.N. Goenka, Jon Kabat-Zinn, Jack Kornfield, Joseph Goldstein, Tara Brach, Alan Clements, and Sharon Salzberg, who have been widely attributed with playing a significant role in integrating the healing aspects of Buddhist meditation practices with the concept of psychological awareness and healing. The accounts of meditative states in the Buddhist texts are in some regards free of dogma, so much so that the Buddhist scheme has been adopted by Western psychologists attempting to describe the phenomenon of meditation in general. [lower-alpha 11] However, it is exceedingly common to encounter the Buddha describing meditative states involving the attainment of such magical powers (P. iddhi) as the ability to multiply one's body into many and into one again, appear and vanish at will, pass through solid objects as if space, rise and sink in the ground as if in water, walking on water as if land, fly through the skies, touching anything at any distance (even the moon or sun), and travel to other worlds (like the world of Brahma) with or without the body, among other things, and for this reason the whole of the Buddhist tradition may not be adaptable to a secular context, unless these magical powers are seen as metaphorical representations of powerful internal states that conceptual descriptions could not do justice to. The Wangchuk Dorje's "Ocean of Definitive Meaning", major text on Mahamudra meditation. Dakpo Tashi Namgyal's "Mahamudra: The Moonlight - Quintessence of Mind and Meditation"
↑ Goldstein (2003) writes that, in regard to the Satipatthana Sutta, "there are more than fifty different practices outlined in this Sutta. The meditations that derive from these foundations of mindfulness are called vipassana..., and in one form or another — and by whatever name — are found in all the major Buddhist traditions" (p. 92). 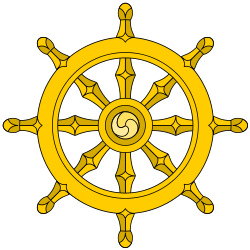 The forty concentrative meditation subjects refer to Visuddhimagga's oft-referenced enumeration. Regarding Tibetan visualizations, Kamalashila (2003), writes: "The Tara meditation ... is one example out of thousands of subjects for visualization meditation, each one arising out of some meditator's visionary experience of enlightened qualities, seen in the form of Buddhas and Bodhisattvas" (p. 227). ↑ Examples of contemporary school-specific "classics" include, from the Theravada tradition, Nyanaponika (1996) and, from the Zen tradition, Kapleau (1989). ↑ For instance, from the Pali Canon, see MN 44 (Thanissaro, 1998a) and AN 3:88 (Thanissaro, 1998b). In Mahayana tradition, the Lotus Sutra lists the Six Perfections (paramita) which echoes the threefold training with the inclusion of virtue (śīla), concentration (samadhi) and wisdom (prajñā). To arrive at the experiential realization of the truths it is necessary to take up the practice of meditation — first to strengthen the capacity for sustained concentration, then to develop insight. ↑ These definitions of samatha and vipassana are based on the "Four Kinds of Persons Sutta" (AN 4.94). This article's text is primarily based on Bodhi (2005), pp. 269-70, 440 n. 13. See also Thanissaro (1998d). ↑ Bodhi (2000), pp. 1251-53. See also Thanissaro (1998c) (where this sutta is identified as SN 35.204). See also, for instance, a discourse (Pali: sutta) entitled, "Serenity and Insight" (SN 43.2), where the Buddha states: "And what, bhikkhus, is the path leading to the unconditioned? Serenity and insight...." (Bodhi, 2000, pp. 1372-73). When [the Pali discourses] depict the Buddha telling his disciples to go meditate, they never quote him as saying 'go do vipassana,' but always 'go do jhana.' And they never equate the word vipassana with any mindfulness techniques. In the few instances where they do mention vipassana, they almost always pair it with samatha — not as two alternative methods, but as two qualities of mind that a person may 'gain' or 'be endowed with,' and that should be developed together. ↑ Michael Carrithers, The Buddha, 1983, pages 33-34. Found in Founders of Faith, Oxford University Press, 1986. The author is referring to Pali literature. See however B. Alan Wallace, The bridge of quiescence: experiencing Tibetan Buddhist meditation. Carus Publishing Company, 1998, where the author demonstrates similar approaches to analyzing meditation within the Indo-Tibetan and Theravada traditions. ↑ See, for instance, Bodhi (1999). ↑ For instance, see Solé-Leris (1986), p. 75; and, Goldstein (2003), p. 92. ↑ Sarah Shaw, Buddhist meditation: an anthology of texts from the Pāli canon. Routledge, 2006, pages 6-8. A Jataka tale gives a list of 38 of them. .
↑ Buddhaghosa & Nanamoli (1999), pp. 85, 90. ↑ Buddhaghosa & Nanamoli (1999), p. 110. ↑ Regarding the jhanic attainments that are possible with different meditation techniques, see Gunaratana (1988). ↑ Tiyavanich K. Forest Recollections: Wandering Monks in Twentieth-Century Thailand. University of Hawaii Press, 1997. ↑ Wu, Rujun (1993). T'ien-t'ai Buddhism and Early Mādhyamika. University of Hawaii Press. ISBN 978-0-8248-1561-5. ↑ Abe, Ryūichi (2013). The Weaving of Mantra: Kūkai and the Construction of Esoteric Buddhist Discourse. Columbia University Press. p. 45. ISBN 978-0-231-52887-0. ↑ "What We Mean by Our Practice | Namchak". namchak.org. Retrieved 2015-12-31. ↑ See, for instance, Zongmi's description of bonpu and gedō zen, described further below. Kamalashila (1996, 2003). Meditation: The Buddhist Art of Tranquility and Insight. Birmingham: Windhorse Publications. ISBN 1-899579-05-2. Available on-line at http://kamalashila.co.uk/Meditation_Web/index.htm. Olendzki, Andrew (trans.) (2005). Sedaka Sutta: The Bamboo Acrobat (SN 47.19). Available at http://www.accesstoinsight.org/tipitaka/sn/sn47/sn47.019.olen.html. Thanissaro Bhikkhu (trans.) (1998a). Culavedalla Sutta: The Shorter Set of Questions-and-Answers (MN 44). Retrieved 2007-06-22 from "Access to Insight" at http://www.accesstoinsight.org/tipitaka/mn/mn.044.than.html. Thanissaro Bhikkhu (trans.) (1998b). Sikkha Sutta: Trainings (1) (AN 3:38). Retrieved 2007-06-22 from "Access to Insight" at http://www.accesstoinsight.org/tipitaka/an/an03/an03.088.than.html. Thanissaro Bhikkhu (trans.) (1998c). Kimsuka Sutta: The Riddle Tree (SN 35.204). Available on-line at http://www.accesstoinsight.org/tipitaka/sn/sn35/sn35.204.than.html. Thanissaro Bhikkhu (trans.) (1998d). Samadhi Sutta: Concentration (Tranquillity and Insight) (AN 4.94). Available on-line at http://www.accesstoinsight.org/tipitaka/an/an04/an04.094.than.html. Thanissaro Bhikkhu (trans.) (1998e). Vijja-bhagiya Sutta: A Share in Clear Knowing (AN 2.30). Available on-line at http://www.accesstoinsight.org/tipitaka/an/an02/an02.030.than.html. Thanissaro Bhikkhu (trans.) (1998f). Yuganaddha Sutta: In Tandem (AN 4.170). Available on-line at http://www.accesstoinsight.org/tipitaka/an/an04/an04.170.than.html.